In the 1960s, the MGM-produced Man from U.N.C.L.E. was one of the few TV shows that was successfully repackaged for American theatrical release. A little bit more action and seduction was added to two-part episodes that were then distributed in color, at a time when most televisions were in low def black-and-white. Frankly, it is rather surprising it has taken this long for the franchise to get the Hollywood reboot treatment. Happily, Guy Ritchie and co-screenwriter-co-producer Lionel Wigram harken back to the original first season more than the three shtickier years that followed. Nor do they attempt to update it for younger, dumber generations. The sixties are swinging and the Cold War is slowly boiling in Ritchie’s The Man from U.N.C.L.E. (trailer here), which opens today nationwide. Napoleon Solo is a suave as it gets. The roguish CIA agent reluctantly agreed to put his talents at Uncle Sam’s disposal, when his career as an international art thief was thwarted through dumb luck. His latest mission will be smuggling Gaby Teller out of East Berlin. Illya Kuryakin is an ardent Communist. That means he is not suave at all, but as a KGB agent, he is decidedly lethal. His latest mission will be keeping Teller in East Berlin. He will fail, but he will soon meet Solo and Teller again in Rome, ostensibly working together. In a rare case of Cold War collaboration, the rival intelligence services will combine forces to stop a rogue element from building a super potent nuclear weapon with the help of Teller’s long estranged scientist father (Teller is indeed a credible name for a nuclear physicist, after all). Of course, it will be every spy for himself when it comes to retrieving this Teller’s research. Like the source television show, the new U.N.C.L.E. kind of-sort of represents an idealist manifestation of détente during the height of the Cold War. However, Kuryakin’s backstory of doggedly striving to compensate for his family’s fall from grace during the Stalinist Purges would hardly earn Alexander Cockburn’s seal of approval. However, it adds a note of clear-headed historical context and makes Kuryakin’s proletarian plugger considerably more compelling. Frankly, he needs the help, because Henry Cavill’s Solo eats Armie Hammer’s Kuryakin for lunch time and again during the film. Cavill’s scenery chewing work represents a star-establishing turn that out-Bonds James Bond, without descending into outright camp. Further upstaging Hammer, Alicia Vikander finally lives up to her hype as the next big thing smoldering up the screen as Gaby Teller. Unfortunately, Elizabeth Debicki and Deutschland ‘83’s Sylvester Groth are just okay as the standard issue Euro-villains, but Rome sure looks fab. Arguably, Ritchie is the most stylish director whom a major studio would trust with the keys to their shiny new prospective franchise reboot—and his sensibilities are perfectly attuned to the look and tenor of vintage Fellini Rome. His U.N.C.L.E. just oozes attitude and sophistication. He also has a hip ear for music (even though Les McCann & Eddie Harris’s rendition of “Compared to What” would have been even cooler for the opening titles than Roberta Flack’s). Thanks to Ritchie’s disciplined flamboyance and key contributions from cinematographer John Mathieson and costume designer Joanna Johnston, U.N.C.L.E. is retro but not kitschy. Altogether, it is rather a good deal of throwback fun. 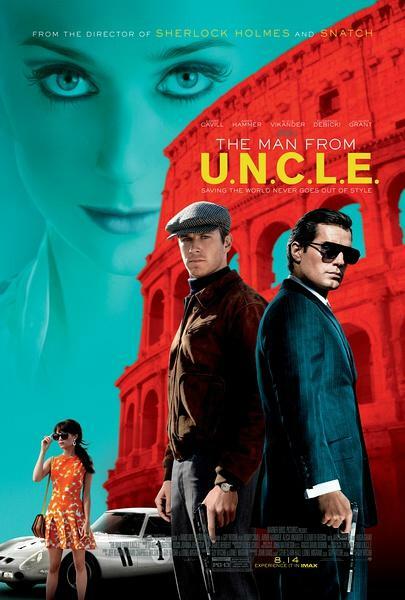 Recommended for fans of the old school spy thrillers, The Man from U.N.C.L.E. opens wide today (8/14), including the AMC Empire in New York.